Since its founding in 1993, Nimba Anvils has been owned and operated by professional smiths dedicated to the craft of blacksmithing. Russell Jaqua, founder of Nimba Anvils, was asked to write an article for The Anvil's Ring in 2000. Current owners, Jim and Lester Garrett, who were close friends and colleagues of Russell for thirty years, are delighted to reprint this article regarding the history of Nimba Anvils. 1. 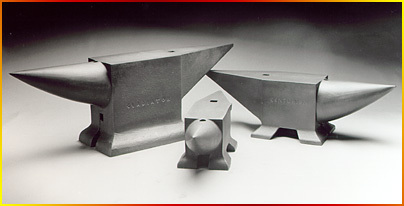 Gladiator anvil pattern, made of wood, around which the sand mold is packed. 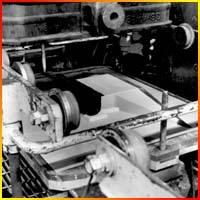 Later, the pattern is removed to create the mold cavity into which the metal will be poured. y involvement in the manufacture of blacksmith anvils happened in the most circuitous of ways. It all started in the early 1970s. A friend who had attended Alma College with me, Stephen Bondi, later pursued metalsmithing in art school. 2. Preparing the Gladiator anvil mold: the casting flask, made up of cope and drag, is centered over the Gladiator pattern board. 3. Foundryman finishes filling the anvil pattern drag with sand and packs it down firmly with a rammer. Steve had the opportunity to intern at the shop of Anthony and Simon Benetton in Treviso, Italy. Toni Benetton was a man ahead of his time both in the style of his work and in the equipment he used to achieve it. Stephen returned to this country with a whole body of knowledge regarding contemporary blacksmithing that I would not have been exposed to otherwise. This Italian influence has been a primary inspiration in the direction of my own career. 4. Sand anvil molds with vents ready for pouring. The vents direct the release of gases away from the cavity mold. 5. Pre-heating the crucible prior to pouring a batch of anvils. I immediately incorporated the use of a large industrial air hammer, a Nazel 3B, into my own shop. But due to the lack of anvil production in Italy after WWII, I was unable to locate an Italian pattern anvil. 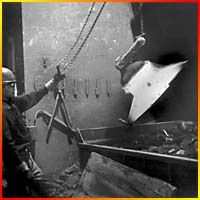 However, I did work on such an anvil in the Bondi metalshop while I was a journeyman there in 1980. This exposure convinced me that the Italian pattern was both the most functional and the most elegant of anvil designs. 6. 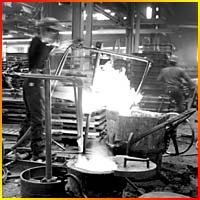 Pouring steel from the induction furnace into a crucible just prior to an anvil pour. 7. 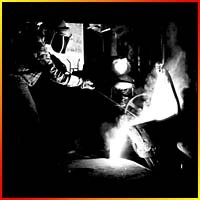 Foundryman pours molten steel from crucible into pour gate of anvil sand mold. Years later, in the late-80s, I developed a great friendship with the lead teacher of the Wooden Boat School in Port Townsend, Jeff Hammond. His great woodworking skill convinced me that I had found someone who could build an anvil pattern exactly to my specifications. 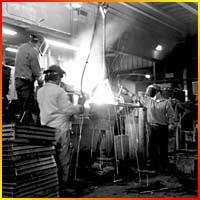 With the encouragement of Steve and Michael Bondi, the industrial know-how of Art Jones, and five years of often frustrating "research and development," mostly involving finding the most competent foundrymen and heat treaters in the Seattle area, the first Gladiator anvil was poured in 1993. 8. The shake-out: Anvil casting is rattled out of sand mold. 9. Cast anvils are finished at the machine shop. Top and bottom faces are milled and the pritchel hole is drilled. 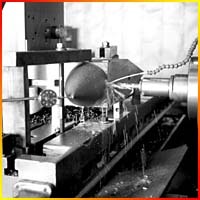 Originally, I had pursued this manufacturing process solely with the aim of making an Italian-pattern anvil for myself. Later, other members of the Northwest Blacksmith Association encouraged me to produce a small batch for them. 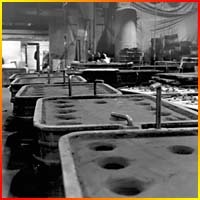 Now, seven years later, it is a growing business, with Nimba Anvils sold all over the world. I knew I really had something when the first sale to Finland happened. I feel very good about the whole experience because I know I am offering an excellent tool to the profession that I most respect in the world. I hope that I will be remembered for my sculpture, but I am certain that future generations of blacksmiths will be glad for my anvils. Gladiator Anvils, Titan Anvils, and Centurion Anvils after a final dress. All Nimba anvils are inspected and final-dressed by Jim Garrett prior to being heat-treated. Heat treatment results in Rockwell 50-52 hardness on all surfaces of the anvil. 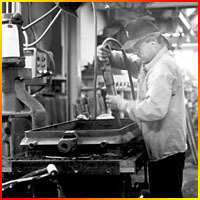 The 8640 steel, with which the anvils are cast, is known for its deep-hardening properties. This article appeared in Anvil Magazine 11/2000, Anvil's Ring Fall 2000, and The Fabricator 1-2/2001.